This window covering of fabric makes soft folds when pulled up. In their simplest form, Romans are flat when extended fully and pull up in stacked pleats, revealing the window. Roman shades are a good choice when you want a simple, clean-lined way to get color or texture on the window in one layer. 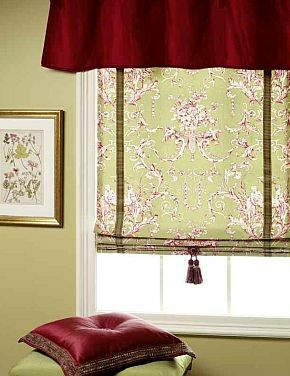 Roman shades also work well layered under drapery panels or valances. They filter sunlight and offer privacy. They can be mounted inside or outside the window casings. Mounting the more tailored styles inside the window casings creates a "framing" effect from the exposed woodwork. Check out the styles and options of Roman shades for your New Jersey home. Click on the pictures or buttons for more detail about any style. Trim can be applied along the bottom or top edge - tassels, center buttons, beads or banding are common. Certain styles support vertical banding, running the length of the shade. Although the bottom is usually straight, the relaxed style Romans have curved bottoms, sometimes accentuated by side flaps (or dog-ears). 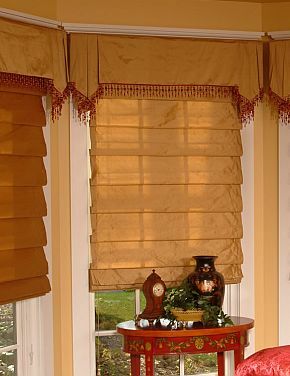 Roman shades are lined to protect the face fabric and add body to the pleats. Interlining will add fullness to the pleats. Blackout lining is a good choice for bedrooms where complete darkness is desired. Blackout also keeps sunlight from diluting the tones of light colored fabrics. ... without using up much of your time just to get started. Most of the early steps can go by phone (800-889-8858) or email. Check out the style guide above. Click through to the details for the styles that appeal to you to see additional examples. Or maybe you have bookmarked a style that you like from elsewhere. Send it to us! Width across the face of the window from casing to casing. Length along the face of the window from head to sill. In inches. This will get us started without getting too technical. Photos help. Hi. I have a kitchen with 4 windows. They are about 28" wide and 43" tall. I want some flat roman shades for these windows. I've seen some floral prints with light harvest colors in them (amber, tan, dusty red and faded green) that would work. I'll send you some images of them. I have attached a photo of some roman shades from a friend's house. What I don't like about them is the gap along the window frames and theway they don't hang straight along the edge. Also, I would need them to be measured and installed. I live in Cherry Hill, New Jersey. You have a style. And sizes. And some potential fabrics. We can get you some initial prices. Which is the part where we will come to see you. And measure your windows. And make sure that all we've talked about so far can work. And finalize any details and options. Then we will send you a final cost, including installation. 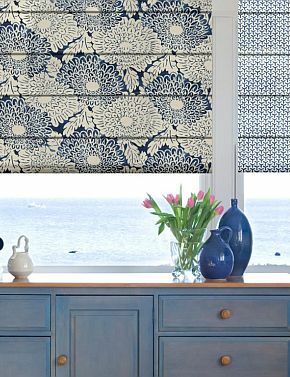 Architectural Digest published an overview article featuring some of the advantages and options of Roman shades for your windows: Design Tips: When to Use Roman Shades. 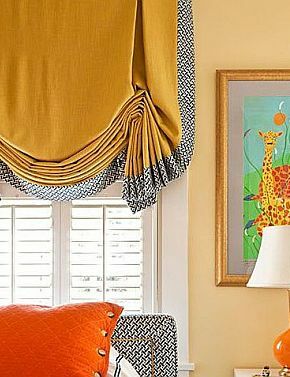 From a tapestry for your windows to soft light filtration and privacy, Roman soft shades work with many fabrics, many window styles and many decorating goals. 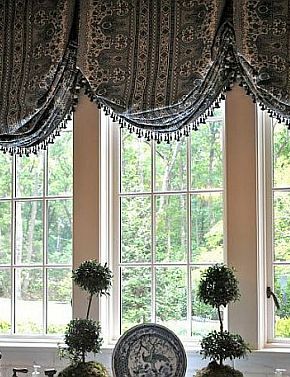 Roman soft shades to grace your windows from the quality workrooms at Kasmir, Carole Fabrics and Robert Allen. Serving southern New Jersey, Delaware and the Jersey shore areas. Our service area includes: Gloucester County, Camden County, Burlington County, Cape May County, Atlantic County, Cumberland County, and Salem County. 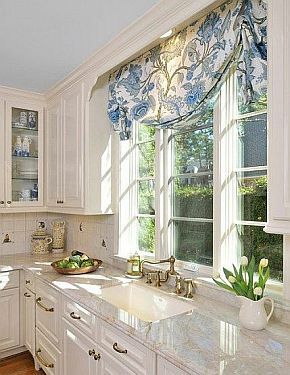 So if you live in Egg Harbor, Sewell, Haddonfield, Mullica Hill, Ocean City or Mt Laurel and nearby neighborhoods, we can help with Roman shades for your windows.